It has been a few months since I last did a review. Massage tables worth reviewing don’t come along too often, maybe every few years and to date I have covered the best of the best available in the UK and Europe. The Bodypro deluxe is a great massage table and since reviewing it I have gotten emails from readers saying how much they loved it. BodyPro was getting a lot of request from customers looking for the same high quality components that come on the deluxe model but they also wanted a raising backrest for offering seated treatments. I purchased the new BodyPro Deluxe Liftback version 1 month ago and have been putting it through daily use so I can let you know how it stands up against the original BodyPro Deluxe and also other similar models available. As I mentioned in my original BodyPro Deluxe review, massage tables can mostly be broken down into three quality levels. Budget, with a very low level of quality. Entry level providing good value for money and thirdly Professional level, where the massage table is built with the highest quality components and build quality. BodyPro which is a relatively new brand kind of fits in between the top two levels. It is basically a very high entry level brand. They use very high quality foam and upholstery on their massage tables and put extra features like cross bracing on the leg frame to make sure the table is very stable and solid. I normally would never buy an entry level table myself. It is kind of a false economy because the price difference is usually only the cost of you doing 2-3 treatments so over the course of the lifetime of the massage couch it really doesn’t cost you that much extra and probably ends up increasing your client return rate. However, I would use and do recommend the BodyPro range if your budget is not up to professional level yet and you want to get the highest quality table for an entry level price. If you are on a budget please don’t buy a cheap budget table on ebay or amazon as you will actually end up paying more when you buy another one not so long after. I hear so many stories of people having to buy a second table only a few months after the first. It used to be very hard to come by a second hand massage table but having recently checked ebay, there are hundreds on there. No doubt it is people who bought the cheap massage tables and then try to sell them on when they realise how crap they are! 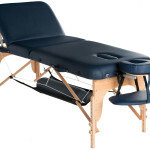 The BodyPro Deluxe Liftback is a high quality massage table at an entry level price. I paid £199 for it and if you can get it for under £200 it is great value for the features. At 7cms thick, you can definitely feel the quality of the foam on this model. The extra comfort is very noticeable over thinner foam massage tables. and you can really feel the extra comfort on this one. I love massage tables with both breath hole options as you can choose which one you prefer and switch up for certain positions or treatments. The breath hole in the table is very generously cut. The PU leather is luxurious and soft to touch yet this type of leather is actually more durable than PVC. This is the highest quality PU I have experienced on an entry level massage table. The legs have double height adjustment knobs for extra strength and security and reiki end panels make sitting on a stool more comfortable for head, neck and reflexology treatments. 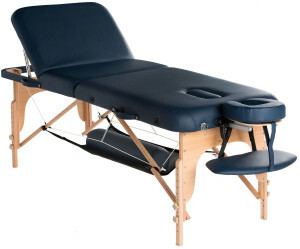 This model has 2 x side arm extensions which can slot in to the top or the middle of the massage table and also a reasonably large hanging arm shelf so the positioning of arms during treatment for both access and comfort is well catered for. The thicker foam and wooden construction and backrest supports make this a heavier table than the flat deluxe version so I would call this a non-mobile massage table. It is of course folding. portable and very movable but too heavy for carrying on your shoulder IMO. If you do like all the features and want to travel with it occasionally it is best to get a wheeled cart or transporter. To sum up, if you need a lifting backrest for seated treatments and don’t have the budget to get either the Earthwork Harmony or Earthworks Spirit – GET THIS! Have you bought the BodyPro Deluxe Liftback? Would love if you can share your own thoughts about it in the comments below! hi Stephen, does this table have a cross bar on the legs (you mention it but I wasn’t sure if it was a generic comment)? im a reiki healer only at the moment but intend on training in massage & reflexology in the future. I have a room that I rent at a friends salon (using her static table) but need to get my own asap! I need a table that is strong enough for static work and light enough to take with me should I need to attend other clinics or clients homes… I love the versatility (the back rest being a big plus) of this table and believe it could be and excellent all round table for me to use over the next couple of years while I train….. Ive short listed this table based on its equipment, size, comfort and build quality. it also suits my budget! the only thing holding me back is weight….. you said in your review you thought it wasn’t a good mobile choice, do you still stand by that? would you recommend it with a trolley? being a non professional at the moment i am struggling to make a decision and have been procrastinating for a few months…I need a table by the 5th aug so I am running out of time! I decided to purchase this table based on your website’s review (and in turn, Amazon’s reviews). I don’t intend to be mobile with this table, so the weight wasn’t much of a consideration and I like a lift back for reflexology. My current table gets light-to-moderate use on a weekly basis and my budget doesn’t quite stretch to a fully professional table – happy to find one that is rated somewhere in between. I wanted a bigger table that was more comfortable, robust and would make my larger clients feel more relaxed. I wouldn’t call my existing table a “mistake” but it was a higher-end budget table and never intended to be a long-term option. It will be happily retired to occasional mobile treatments! Hi Stephen, many thanks for such a fab site ! I decided to buy the Earthworks touch plus after reading all your reviews. I love the quality but the only issue I find though is that a lot of these tables are strangely limiting on the length if you use the face hole in the main body of the table and you end up with feet hanging off the end. It seems strange to me to have a face hole but not have the length to accommodate an average height person ? While I often use the face cradle ( for better client experience) I do have a special memory foam cushion for ladies breasts for comfort and this sits much more sturdily on the main body of the table using the face hole. Can you recommend anything with a longer length please that is a similar quality ?